Wat een verdrietig boek zeg. Ik heb toch wel een aantal keer gehuild. God, je zou maar zo'n vrouw hebben, een vrouw die haar kinderen pijn doet om aandacht te krijgen en jou er bij naait. Echt arm kind, pas je op de kinderen, gaat er iets mis en wordt je gewoon de cel ingegooid en niemand die je maar enigszins geloofd. 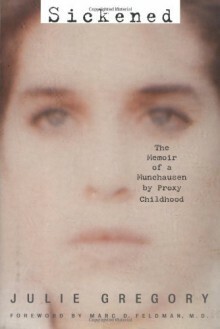 Munchhausen by Proxy is probably one of the most perfidious forms of child abuse. In most cases it's the mother that purposefully makes her child (or children) sick, mentally and/or physically - just so that she can bathe in the attention, the admiration and praiseful recognition she gets for being the devoted, altruistic caretaker of a sick child. Often, it's only recognized when one child has already died and a sibling has mysteriously fallen ill with similar symptoms. Julie, the author and heroine of this story, grew up believing her mother's lies, faithfully going through with countless doctor's appointments, taking a wide variety of meds, missing many, many days of school. She thought of herself as weak, frail, stupid, flawed. She never realized it was her mother that was making her sick. Sure, often the crippling migraines only started AFTER her mother made her swallow a pill... But surely that only meant that her mother knew her well enough to see that a migraine was coming on? Once, when Julie was 13, she blurted out "My mother is making it up! ", out of fear of a scary operation. But it took many, many years before she herself realized that this was nothing but the truth. 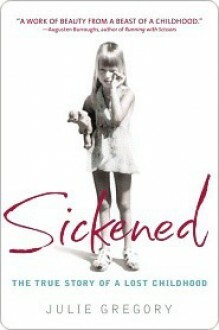 "Sickened" is, well, the sickening tale of a mother who will stop at nothing to make the world revolve around her, sacrificing the well-being of her own children, a variety of foster children and her husband without a second thought. She uses many means beyond the Munchhausen, like telling outrageous lies to her husband to make him mad enough at the children that he will beat them, or threatening suicide. And surprisingly, I found the book was very well-written, too. There's something rather poetic about the language, and it's impressive how crystal-clear the author is able to look at her own life. This was painful to read. 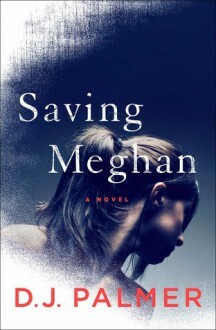 You find out mid-way through the book that Julie's mother seemed to have suffered abuse as a child too, but at that point it was too late for me to feel anything but disgust for her and her behavior. This is to say nothing of her father, abusive, mentally unstable and unable to see her mother's emasculating insults as what they truly were: goading to become a part of assaulting and traumatizing their daughter. How do these people find each other? It seems unreal that this could happen for so long (and to a variety of other children too, with lesser degrees of severity) and not be noticed by medical professionals or school administrators or anyone! Her memory is really (and terribly) quite amazing. On a side note, the SHEN therapy experience Julie has as part of her recovery reminds me of She's Come Undone, going into a comforting almost womb-like state. Really amazing book. She told her story clearly and believably, with way less self pity than you'd expect. Shocking lack of whining, all things considered. And as an added bonus, she's just an extremely talented writer in every way.